ITS DONE!!!! 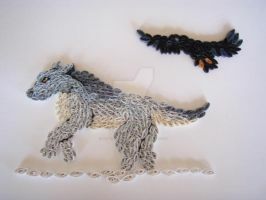 My wolf paper quilling is finished! Sorry about the blurry pic >.> and it actually is more blueish in real life, but oh well! DON'T KNOW WHAT PAPER QUILLING IS? Hello! I wanted to let you know that this was featured in #projecteducate's Artisan Crafts Week as one of the most notable examples of artisan crafts. You can read the article here: [link] and feel free to be a part of the Artisan Crafts week, we have lots of activities and a contest going on! omg og omg omg! I finally found what this is called! after like 2 years!!!!!! This is really well done by the way! This is amazing! 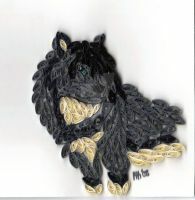 I just discovered quilling and was getting a few ideas as to what can be done with this style of art. If i could do something like this, my dad would be ecstatic because he loves wolves. Wow, how long have you been working on it? Well, what can I say - you're very patient! Thanks for sharing your work with dA! This is wonderful! How do you make things like this? Oh jeez, I'm a dumb a I have troubles with reading everything that's given to me, I didn't see the FAQ link. Anyways, this is truly wonderful and worth the effort! OMG!!! that is awesome! i should try something like that.... great job! That's neat! What is quilling paper exactly? its were you take a small tool (its like a thin rod) and some thin strips of paper and roll them. Then you pinch the sides to get that footballish shape and glue them together. That's really interesting. I'm surprised I've never heard of it before. Hope to see more of these! 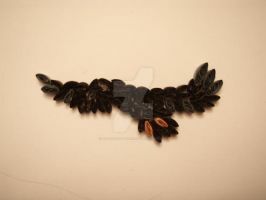 This piece has been featured in this news article. If you have any qualms with the feature, please send me a note. thank you so much!!!! hehe, okay, now I feel really good! wow! very creative, I like it! ZOMG!! That is awesome !!! so a fav!! For the lost that will never be bribed.